The late, great management and quality guru, W. Edwards Deming described the numbers rating customer satisfaction as, "unknown and unknowable, but critically important." 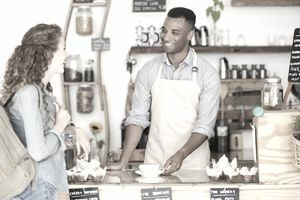 In today's social media world, we chronicle our experiences with business interactions in real-time, alerting the world to our satisfaction (or dissatisfaction) with retailers. For any manager, the opportunity for positive feedback to go viral is exciting, while a chronicled negative experience lives forever in cyberspace. The measurement and monitoring of customer satisfaction is an essential management activity and one filled with opportunities to promote organizational learning and continuous improvement. If you are a member of the team at Ritz Carlton Hotels, the idea that you are one of the "ladies and gentlemen serving ladies and gentlemen" is ingrained in your personal and professional mindset. You are aware that you are a critical representation of your organization and brand, and you are entrusted with ensuring customer satisfaction at every instance. As a member of the Mayo Clinic organization, your core value is, "the needs of the patient come first." Every single decision is filtered against this core value and customer satisfaction is monitored and measured to ensure the value is upheld. For many airlines, the focus is on critical customer safety, however, it often appears to frequent flyers that customer satisfaction is not a key business driver. Airlines are diligent about measuring on-time arrivals and departures but rarely address how happy (or unhappy) their customers are with the overall experience. At upscale retailer Nordstrom's, remarkable customer service is something every associate is trained and motivated to deliver. Personal representatives are known to come in on their days off to help clients, especially long-term customers. The examples above illustrate a range of customer service experiences. If your primary means of creating value focuses on the customer experience and service level, then you should incorporate this into every aspect of your business. This starts with hiring and training employees to find opportunities to surprise and delight customers at every turn. This discipline then becomes an integral part of your business strategy and one you can measure and monitor from many angles. If your focus is on product innovation or operational excellence, your customer satisfaction emphasis needs to reflect this. You need to regularly monitor whether or not customers view your offerings as the most innovative in the marketplace. Value discipline and strategy define a firm's priorities and these measures are identified in order to assess how well a firm is performing against those priorities. Ideally, the firms look for key drivers of success, leading indicators that predict a future change in outcomes, and lagging indicators that assess how the firm performed against targets. If customer satisfaction is core to the firm's DNA, then measures of overall experience are critical. While it seems counter-intuitive to invest in strengthening customer satisfaction, it might not benefit a firm's revenue stream or profit margin. Customers often place their emphasis on other factors. You might not care that your plumber did not surprise and delight you as long as the water in the kitchen sink now flows smoothly and the price was reasonable. The plumbing firm could choose to invest in friendly, joke-telling individuals dressed in smart uniforms and purchase a fleet of fancy trucks. However, customers would not feel compelled to retain their services more often, if at all. Another late, great management guru, Peter Drucker, suggested that the purpose of a firm is "to acquire and keep customers." A dissatisfied customer reduces repeat business and potentially costs you future customers because customers won't be referred to you. Part of your job as a manager is to match customer expectations (and steps taken by your competitors) in your particular marketplace and industry. To ensure quality and satisfaction you then need to develop your own unique and meaningful approach to serving your critical audience. Before embarking upon a measurement program, carefully consider what customer satisfaction truly means for your customers and your firm's overall strategy.